Three-quarters of rivers in England and Wales fall below a new European environmental standard, according to a report from the Environment Agency. But the report also says that water quality has improved for the 19th year in a row, and that wildlife is returning to a number of rivers. Environmental groups want tougher action as only five of the 6,000 rivers surveyed are classified as pristine. The agency announced plans to improve more stretches of river by 2015. It says there have been improvements in water quality under the measures used for the last 20 years. These results show that seven out of 10 English rivers and nine out of 10 Welsh rivers achieved what is termed "very good" or "good" status in terms of chemical and biological water quality in 2008. The improvement has led to the return of species that were once thought to be in terminal decline along some stretches of river. 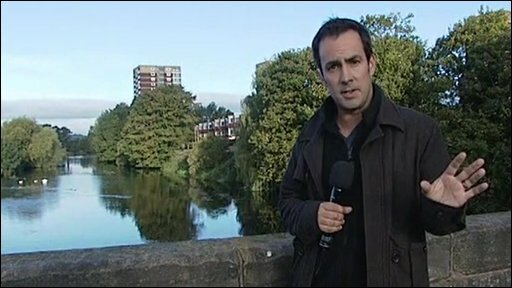 "Our rivers are at their cleanest for over a century, which is why we are seeing the return of otters, eels and salmon to the Thames, Mersey and Tyne," said the Environment Agency's chief executive Paul Leinster. The agency says the improvement has been brought about by tougher action on polluters, changes in farming practices, investment by regional water companies, and hundreds of local clean-up projects. However, the European Water Framework Directive, which became law in the UK in 2003, sets even higher quality standards, using a wider and more sophisticated range of more than 30 different measures. Only 26% of rivers in England and Wales are classified as "good" under the new requirements, and only five satisfy the highest standards. These are in remote areas of Northumberland and Wales. Under the new standards, 117 rivers are classified as being in bad condition. These include stretches of the rivers Trent and Stour. Environmental groups say this means they are among the worst in Europe. The RSPB's director of conservation, Mark Avery, welcomed the millions of pounds invested by the water industry over the past two decades, which he said had brought real improvements. But he said there was a long way to go, and the report should serve as a wake-up call to the government. "Pollution from agriculture, over-abstraction and poor town planning are all factors threatening what is an extremely important habitat for wildlife," he added. "Otters, water voles, kingfishers and more than 30 species of fish all rely on our rivers and we have a responsibility to keep them healthy and clean." WWF's freshwater policy advisor Tom Le Quesne said: "Unless we take action now to stop the decline in the health of our rivers, then we are storing up a raft of problems for the future. "We are heavily reliant on this precious resource, and our legislation and actions must deliver a positive improvement to its state." The Environment Agency also announced measures to improve more rivers by 2015. The River Basin Management Plans include tackling discharge from sewage works, limiting the removal of water from rivers, and preventing pollution from farmland and built-up areas leaking into watercourses. "We need to go even further to meet the new EU measures for water quality," said Dr Leinster. "That is why we have announced plans to clean up 9,000 miles of river over the next five years." Environment groups criticised the plans as too limited in their ambitions, as only 5% more rivers will achieve "good" status by 2015. The plans will be finalised later this year after approval by ministers. 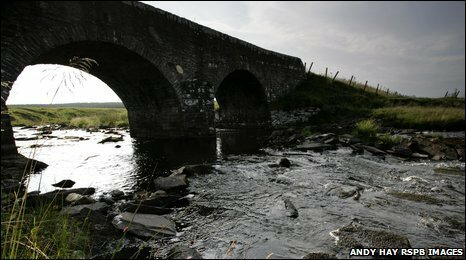 The Scottish government plans to publish its River Basin Management Plans in December, with measures to be fully operational by 2012. In Northern Ireland, the Rivers Agency has designated four River Basin Districts.